Police Break Up Zimbabwe 'Mega-Demonstration' In Defiance Of Court Order : The Two-Way Police fired tear gas and deployed water cannons to disperse a demonstration that represented a united opposition front against longtime ruler Robert Mugabe. A court-approved protest staged by Zimbabwe's opposition supporters seeking electoral reforms turned violent Friday in Harare when it was broken up by police. In Zimbabwe's capital city, police fired tear gas and water cannons to disperse a demonstration that the country's top court had ruled could proceed. Opposition leaders termed Friday's march in Harare a "mega-demonstration." It marked "the first time that Zimbabwe's fractured opposition joined in a single action to confront President Robert Mugabe's government since 2007," as The Associated Press reports. Former Vice President Joice Mujuru, who is now at odds with Mugabe, told reporters that 50 people were injured and admitted to the hospital. And Didymus Mutasa, a senior official from Mujuru's party, told Reuters, "Today has been for me the worst day that I have lived in this country, where I have observed with my own eyes, the state breaking its own laws and the state starting violence by attacking people who were just gathered together." The protest was organized by at least 18 opposition parties, as the BBC reports, and demonstrators were "calling for electoral reform ahead of polls in 2018." Mugabe has ruled the country since 1980 and plans to run again. 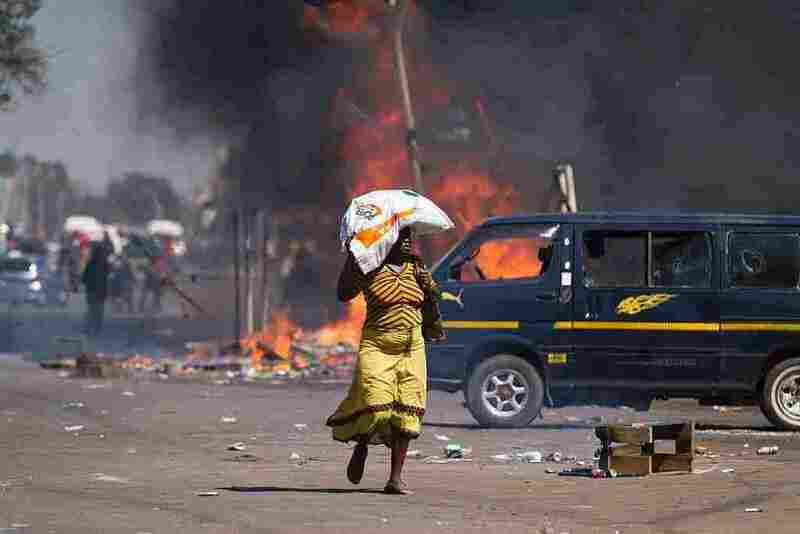 "Clashes spread through the streets of the capital Harare as riot police fought running battles with protesters who hurled rocks at officers, set tyres ablaze and burned a popular market to the ground," according to Reuters. "I was beaten by the police here exercising my constitutional right, beaten with baton sticks by a horde of around 10 police officers," Jonathan Malindati told The New York Times. He was "bleeding from his head and displaying baton marks on his back," according to the newspaper. Ahead of today's demonstration, police had "warned that unauthorized demonstrations would not be tolerated," NPR's Ofeibea Quist-Arcton tells our Newscast unit. "Public protests have become a rare occurrence in Zimbabwe, but there have been a spate of demonstrations in recent months demanding that President Mugabe stands down over economic mismanagement, non-payment of salaries and a chronic shortage of cash." 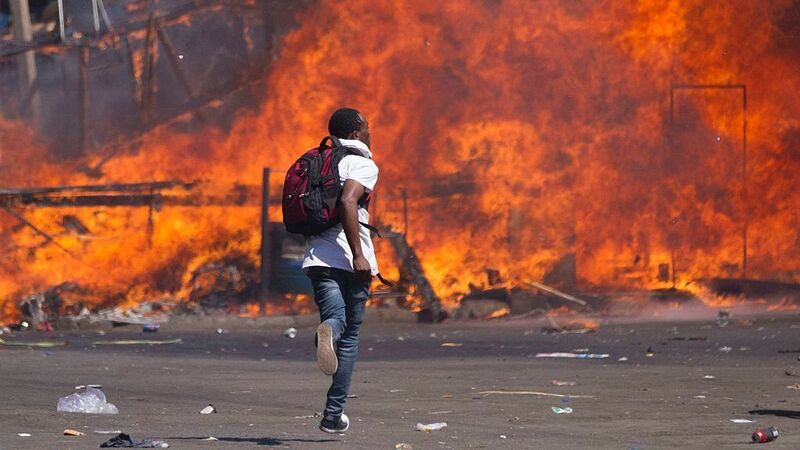 As NPR has reported, Zimbabwean clergyman Evan Mawarire has been at the center of many of those recent protests. He set off a wave of strikes and demonstrations when he appeared on YouTube draped in a flag, calling for change. "This flag, every day that it flies, is begging for you to get involved, to say something, to cry out and say, 'Why must we be in this situation?' " he said in the video, which sparked a movement called #ThisFlag. "It was amazing to see and so humbling to see Zimbabweans come to a place where they were bold enough to say to a government that is known to be harsh, 'Enough is enough and we won't let you treat citizens the way that you are treating them.' That added to the momentum of the citizens' movement that we now have on our hands." The leaders behind Friday's demonstration have vowed to continue taking to the streets. "If that was intended to cow us from demonstrating, I want to say the opposite has been the case. We are going next Friday to do exactly the same as we have done today," Mutasa said, according to Reuters.